nestled in the heart of the Lowveld. Good day, We stayed at Tuscany Mansion in September. We had a wonderful stay, the rooms were beautifully decorated and were always kept sparkling clean. The location is also perfect, just close enough to the buzz of the city, but also far enough to have a peaceful, relaxing stay. We would definitely recommend this guesthouse to anyone travelling to Nelspruit or Witrivier! Hiermee net ‘n bedanking aan Tuscany Mansion Guesthouse. Ons was tuis vir ‘n naweek by Tuscany, en ons is baie vriendelik ontvang. Die eienaar het uit se pad gegaan om ons verblyf baie aangenaam te maak. Tuscany het geen moeite ontsien om in al ons behoeftes te voorsien nie. Van restaurant besprekings tot eetgerei by die swembad is voorsien. Dit was voorwaar ‘n baie aangename ervaring en ons wil sommer nou al bespreek vir volgende jaar! "Tuscany is a breathtaking and neat guesthouse. The host is friendly and the service is excellent. I would refer it to anyone that who needs accommodation in White River." 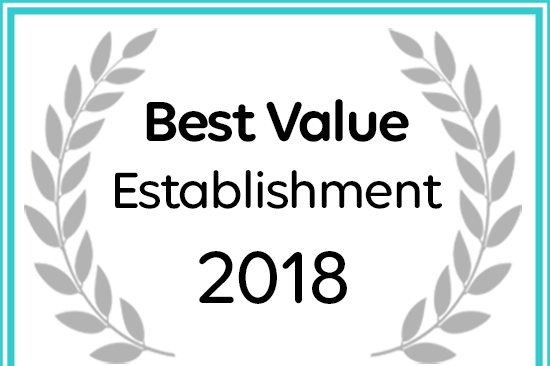 Tuscany Mansion has been named a Best Value Establishment by Afristay.